Assuming no reader would want a graphic of a fur ball I looked for a large ball of twine. I discovered friendly competition with several locations claiming the prize for the biggest in the world. Regardless of the winner, the governments and central banks of the world have created a ginormous fur ball that would make this ball of twine look like a “tiny bb” compared to a giant beach ball. Let’s take the enormity of government debt. The US Debt Clock tells us the government debt is currently over $19 trillion. It’s expected to top $20 trillion by the end of the year. I googled “How long is a trillion seconds?” If the government paid down the debt at the rate of $1 per second, it would take approximately 31,709 years to pay off $1 trillion. $20 trillion would take 634,180 years. That’s probably what they mean when they talk about burdening future generations with our current debt. By then the sun may be turned off and we will probably be back to the ice age. In my former life I taught problem solving. We defined a problem as, “a deviation from the norm we no longer wish to exist”. Today things like zero or negative interest rates, deficit government spending, or banks taking reckless risks have become the norm. A single problem is generally easy – find the cause and apply the remedy. If you get a blister on your foot when wearing a certain pair of shoes, stop wearing them. Life is not so simple today. 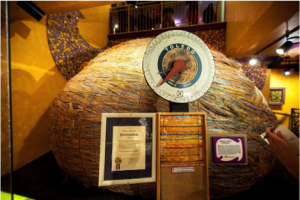 The world’s financial problems are ginormous, even more tightly interwoven than the ball of twine above. The technical term for a highly complicated situation is a “mess”. To effectively solve a mess (series of interrelated problems) you have to break things down to components, determine the underlying cause (s). Next, develop a solution that does not have adverse consequences as a result – you don’t want your solution causing a bigger problem down the road. It may require undoing things from the past. When the government elites decided alcohol was bad they passed ill-advised prohibition laws. Organized crime moved in and filled a market need. Repealing prohibition allowed the government to tax liquor sales, taking away much of the profit from organized crime, so they moved on to illegal drugs to ply their trade. When things get complicated the problem solver must sort through the mess to determine the “true underlying cause” and differentiate it from symptoms. Treating a pain in your side with Novocain might relieve things temporarily, until your appendix bursts and you die from the infection. Let’s take one example and walk it back to see just how complicated things become. Retirement plans today are suffering from lack of income from safe, fixed income investments. We no longer wish this to exist. Retirees long for the 6% Certificates of Deposit and 7% safe bonds of a decade ago. What is the cause of the problem? It blossomed when the government passed the Troubled Asset Relief Program (TARP) bailing out the banks with our tax dollars. The banks no longer needed to compete for money and interest rates went to virtually zero. Could the cause be allowing banks to get too large? We now have a fork in the road. In the wake of the Great Depression, the government passed the Glass-Steagall act, separating investment banks from consumer banking. In 1999 that law was overturned. The big banks gobbled up hundreds of smaller banks – creating banks now deemed “too big to fail”. In 2013 Fortune estimated total bank assets at $14.4 trillion, with 67% controlled by six banks; Goldman Sachs, JPMorgan Chase, Morgan Stanley, Wells Fargo, Citigroup, and Bank of America. Might the true underlying cause be a 1977 law, The Community Reinvestment Act? The politicos used the law as a hammer to force the banks into making loans to people with poor credit, spurring a housing boom that eventually collapsed under the weight of toxic mortgages. That law has not been repealed and banks are still under government pressure to continue the process. The plot thickened when the banks asked for relief. Lending to poor credit risks would put them out of business. Ironically, the day Countrymark Financial filed for bankruptcy, they received a congratulatory letter from the government for meeting their sub-prime lending goals. So what is the underlying problem, and how should it be solved? Here are some examples of what is a very long list. The government should stop with their social engineering requiring banks to lend money to people who are poor credit risks. Would a repeal of the Community Reinvestment Act work? Should they eliminate Fannie and Freddie? Break up the banks deemed “too big to fail” similar to the trust busting days of the 1920’s. Would a law like Glass Steagall separating consumer banks from investment banks with a clear line of demarcation work? Perhaps the real cause is the Federal Reserve, a consortium consisting of the largest banks in America. The Fed is supposed to be protecting our dollar and smoothing out the business cycle – and they have failed miserably. Instead they used our tax dollars to bail out their member banks These same banks find ways to grease the hands of the political class. Would dumping the Fed solve the problem? Would Congress pass real campaign finance reform cutting off their gravy train? Is the real cause the political class freely spending tax dollars to buy votes leaving our country close to $20 trillion in debt? The Bancroft Library outlines the 1985 Balanced Budget and Emergency Deficit Control Act.”The Balanced Budget and Emergency Deficit Control Act of 1985, better known as “Gramm-Rudman Hollings,” created a series of deficit targets meant to balance the federal budget by 1991. If these targets were not met, a series of across-the-board spending cuts (sequestration) would automatically ensue.” Treasury Direct reports: “On September 30,1985 our total government debt was approximately $1.8 trillion.” Doesn’t look like the legislators followed their own laws. Should voters hold legislators in both parties accountable? Everyone wants the cost of government cut, but not at his or her expense. I could continue, but you get the point. It’s a complicated mess, and there is no quick easy fix. I find the election cycle very sad. Politicians, with their never ending quest for power, use our tax dollars to buy votes. Each election cycle brings us new and creative ways; bailouts, debt forgiveness, free cell phones, welfare, you name it. Instead of long-term solutions, the problems continue to compound. Our nightly news is full of, “he said, she said” diverting public attention from the big problems our nation faces. I doubt I’m the only one who is sick and tired of the daily melodrama. “We the People” allowed our political class and central bankers to create this fur ball and “We the People” need to fix it. Part of the challenge is there are now millions who are profiting from the mess and don’t want it fixed. I hope it does not tear our union apart. If you have ever seen a cat cough up a fur ball, it’s not a pretty sight. Neither is fixing our economic mess. It won’t be pretty but one way or another, it will have to get done. So far I have not seen any Thomas Jefferson appear on the horizon. I tip my hat to the Cubs organ player, Gary Pressy. Last week he led the singing of “Take me out to the Ball Game” for the 7th inning stretch. They were honoring him for his 2400th consecutive game sitting behind the keyboard. He has not missed a game in almost 30 years. While I doubt they keep records, if they did it’s unlikely his record would ever be broken. Last week I had the privilege of being interviewed by David Holland on his radio show. We discussed my recent article, “I Don’t have time to plan – I’m too busy!” David does a good job and I enjoy being on his show. I’ve had readers ask what they can do to help build up our readership so we can continue on with this site and keep it FREE. One way is to forward columns to friends encouraging them to sign up – it is FREE. My wife Jo said, “If each reader would do that and get one sign up, our list size would double.” Never looked at it that way; that would be wonderful! Also, interviews like David’s radio show help bring new readers into the fold. I have had a couple of interviews where kind readers have forwarded an article to the host suggesting they might want to interview me. Please feel free to do so, it helps and I sure appreciate it. Let’s close with some clever tidbits courtesy of my friend Bob D.
We have enough “youth”. How about a fountain of “smart”? I think Congressmen should wear uniforms, you know, like NASCAR drivers, so we could identify their corporate sponsors.